First and foremost, there is no entitlement to alimony in Pennsylvania. Instead, it is purely discretionary with the court, and based on 17 distinct factors listed in Section 3701 of the PA Divorce Code. So a spouse who seeks alimony must specifically ask for it in court, or negotiate it with their spouse through the mediation process, which is always recommended first, if possible. Looking to claim rights to alimony in your PA divorce? Alimony is a post-divorce payment that one ex-spouse makes to the other, and is supposed to be based on true financial need by the receiving party going forward. Post-divorce alimony is not to be confused with spousal support or alimony pendente lite which a spouse may be entitled to on a limited basis pending the outcome of their divorce case, and is based on a formula calculation in the PA Support Guidelines. 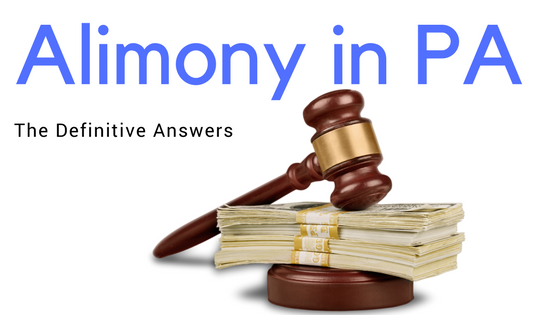 1) How long do you have to be married to receive alimony in PA? Length of the marriage, albeit an important factor in the alimony statute, is but one of the 17 factors to be considered by the court. Typically, the longer the marriage, the greater the case for alimony, assuming other relevant factors also exist. However, there is no minimum length of time that a spouse has to be married in order for alimony to apply. 2) How much is the typical alimony payment in PA? There is really no way to predict what the alimony payment will be (or if there will even be an alimony payment to begin with) when spouses decide to obtain their own attorneys and litigate the issue in court. There are too many variables at play and the issue effectively becomes a roll of the dice. Much will depend on the type of case that is presented by the attorneys on either side or the particular mood of the judge or divorce master. Too often, the real purpose behind alimony gets lost when spouses decide to litigate in court because the focus is on winning and losing. When spouses mediate alimony, they have the opportunity to together decide whether alimony will apply, and if so, what is a fair amount to pay and for how long, in accordance with their budgets and what they need and can reasonably afford. 3) How long do I have to pay alimony in PA? Again, there is no set time period for paying alimony in PA as it is purely discretionary. To be sure, if an alimony payment is going to apply, spouses should carefully evaluate their particular circumstances, what the recipient's future financial needs will be and also what the payor's ability to pay is. For example, a common type of alimony in PA is called "rehabilitative alimony" where one spouse may only need a few years of financial assistance after the divorce to get back on their feet financially, clear their existing debt or perhaps re-train themselves for a new career in a different field. If such a need is recognized, then the alimony payment should only last for a limited period of time (and no more) in order to satisfy this purpose. 4) Am I entitled to one year of alimony for every three years of marriage? This is often a common misconception by those who are navigating the murky waters of alimony in a PA divorce. In many PA county courts, there is an unspoken rule of thumb, not a law, that a recipient should receive one year of alimony for every three years of marriage. However, I always tell my clients that this is not a slam dunk for an alimony claim. First, the court must determine that the matter is appropriate for alimony. Then, the 1 to 3 year alimony presumption is merely a starting point for negotiation and argument before the court or divorce master. From there, the ultimate determination could either be more or less than this presumption. 5) Is there a formula that applies to calculate post-divorce alimony in PA? There is no formula to calculate post-divorce alimony in PA. Again, it is a purely discretionary issue with the court. By contrast, when spouses decide to mediate their divorce, they themselves have the opportunity to control what alimony, if any, will apply. This is achieved most fairly when they each prepare their post-divorce budget of expenses so that they can evaluate what is needed for the receipient in order to reasonably live in their separate household and what the payor can afford. 5) What are the changes to the alimony since the tax reform of 2018? In Pennsylvania , under the previous law, alimony was deductible to the spouse making the payments and included as income on the taxes of the spouse receiving the payments. In a bill that was passed on December 20, 2017 alimony payments will no longer be deductible for the payor, nor taxable for the receipient here in Pennsylvania. The provision of the bill that changes the taxation of alimony will come into effect after December 31, 2018. This means that those divorce and separation agreements signed after December 31, 2018 will operate under this new law.